Stylist Tip: Keep a busy day stylish by carrying this petite handbag. This bag is just too adorable! When I first saw it, I immediately put it in my cart and got one-day shipping. Shipping was one-day late for me, but luckily I didn't leave for China yet. When it arrived, the pink color is a little darker than the site. This bag fits everything I need - wallet, keys, cell phone, make up bag, camera, snacks, etc! The only thing I don't like about it is, if you carry it around a lot and rub it against stuff, it can get easily dirty because the color is light..this is coming from only the PINK one. An example is rubbing against black pants. Seriously in love with this bag. I got it in black, and I always get compliments. It fits a good amount for a bag that seems kind of small. I want it in every color!! Definitely a must-have for spring. Love this bag so much. I had been wanting one for a while and when it finally came back in stock I bought it right away. I bought the black/white one, and i've gotten many compliments on it. Someone even thought it was a real Celine bag. I thought the bag might be too small when i first bought it but it's perfect, especially if you use it as a crossbody. The only complaint I have is that the bottom of the bag is a little rounded and doesnt always stand up, but other than that it is a great quality bag. love this bag. perfect size and doesn't look cheap! I can wear it with everything and anything. well worth the price. I LOVE THIS BAG!!!! I love it so much that I'm gonna be getting the bigger one also ??? it's a must have for sure ? Bought both the black/white and the blue bag. These are super cute to carry your essentials around - keys, phone, wallet, sunglasses, etc - but won't carry that much more. The blue one is not a bright cobalt blue like shown on the website, but a much more dull, boring blue. I sent that one back and kept the black and white one. Super cute and pretty much goes with everything! Quality is decent too. Also, there is only one open pocket inside which doesn't hold much. love this bag LOOKS expensive , outside and inside!! I absolutely love this bag! When I received it, I was shocked by how mini it was but I immediately fell for it. 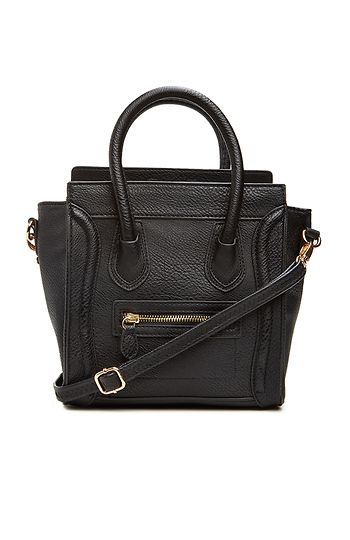 Head over heels in love with this bag. I take it everywhere with me! Totally recommend people to buying this bag!